Growing up in Argentina was probably one of the best things in life. Hands down, very few things can surpass that experience and I wouldn't trade it for anything in the world. For starters, I matured emotionally at an early age as I learned how to cope with cultural differences in a rough way. A very rough way. Argentina is a land of strong cultural identity to begin with, so to break its comfortable flow with my conglomerated melting pot of "different ethnic identities" was equivalent to the struggle of crossing the Red Sea (without it parting in half). Well, it seemed that way at the time, at least. Like I mentioned before though, they have come a looong way in terms of acceptance and from what my friends tell me, it is normal for a native to stop by for some Korean BBQ, or step inside a sushi joint without thinking twice about it. Man, how times have changed! It's little things like that that make me grateful to God everyday. For knowing what I need in order to become a better and more resilient person each day. Despite those hurdles I have come to love everything Argentina has to offer! Those laid back days when tomorrow almost literally never comes, the siesta hours that routinely drive the tired vendors to take a hiatus from work--right around 3pm--the passionate futbol fans parading down the street, and then...there's dulce de leche. People. Meet the offspring of French and Argentinean flavors. All in one. Were it not for my Argentinean heritage and love for all things French, I wouldn't be the baker I am today. Granted, there is so much more to learn and I'm sure Ms. Ina Garten or Giada herself wouldn't approve. But! Through trial and error--and error is far more likely for this gal which is okay since it all ends up in my belly anyway--I've learned to let go and keep bakin'. This idea not all my own. Well, hardly any of it is if you don't count the dulce de leche. 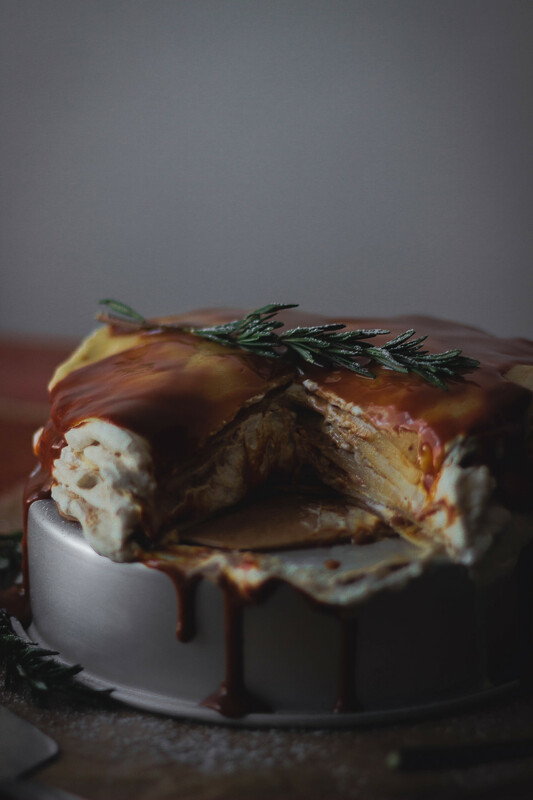 If you've been to the foodie parts of LA, you might have heard of Lady M Confections whose infamous crepe cakes have swept thousands off their feet. Lady M has already mastered this mysterious dessert which many people prefer to call "milles feuilles crepes", literally transliterating to "thousand leaves" from good old français. I normally use the best quality dulce de leche like San Ignacio, but to keep it simple I bought this Nestle can at the nearest Ralphs. When following the recipe, keep in mind that working on the crepes ahead of time (allow about 1 hour) will cut down on a lot of the bulk. My pans have been wearing down so getting the crepes off the pan was a hit or miss towards the last stretch! Using a good enameled pan or a clean, well seasoned iron skillet would be your best option. I only made this cake 9 or 10 sheets tall, but if you use all the batter it should end up at about 18-20 sheets. Of course, double the whipped cream and dulce de leche if you use all the batter. The remaining batter will be great for breakfast with yogurt and fruit, or in the form of these cheesy mushroom crepes. For the crepes, follow the linked directions and try to do it 1 hour ahead of time. This way you can get rid of all air bubbles which make it a lot harder to get the crepes off the pan/skillet. 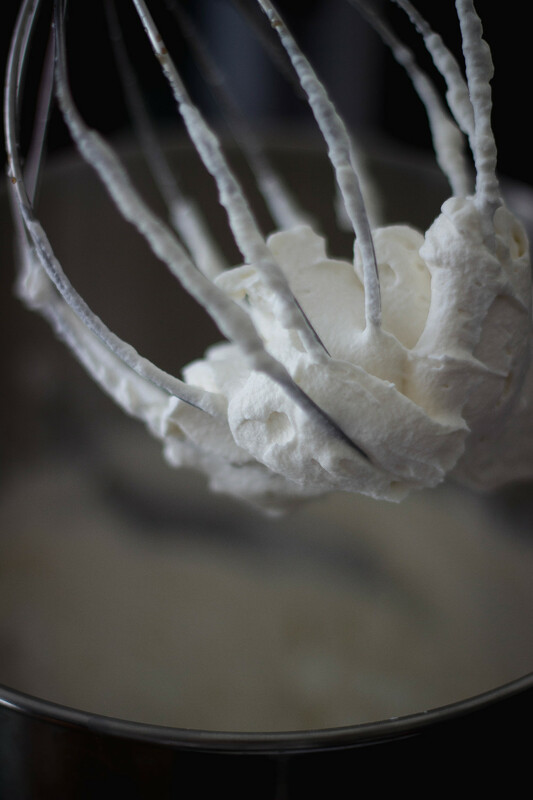 For the whipped cream, it's best to use a beater or mixer, but a food processor does a great job as well. Whip the cream on high speed for about a minute or two, or until cream becomes thicker. Turn off device and add sugar and vanilla, and whip on high speed until soft peaks form, scraping sides as needed. When finished, add dulce de leche (but save a few tbsps) and roughly run a spatula through so they mix in "webs" but don't fully combine. Once the crepes are cooled down, place one crepe on a flat surface. Spoon enough whipped cream+dulce de leche to cover the crepe. 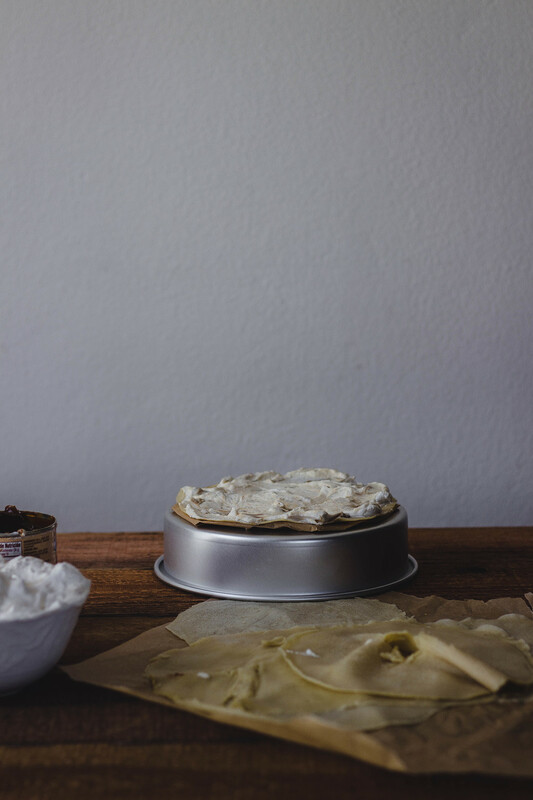 In order to avoid the cake from looking like a dome, spread more cream towards the edges rather than the middle. Cover with another crepe and continue this process until the end. Thin out the dulce de leche you reserved earlier with the 1 tbsp of milk and spread over the top of the cake. Refrigerate and keep it covered! Have you tried crepe cake before? What ethnic flavors do you like to combine? -I love Korean and Japanese!